Donation of blood is a gesture of goodwill and care for the fellow human beings. There is no gift more valuable than a Gift of Blood, as it is actually a Gift of Life for the person who receives it. 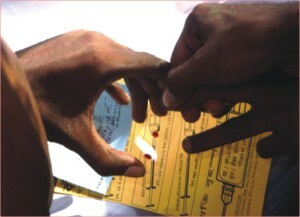 Thousands of patients die in Bangladesh only for shortage of blood every single year. The nightmare for the rush and hunt for a bag of clean fresh blood haunts them who suffered, those who needed blood for him/herself or for his/her relatives or for his /her nearest one. Badhan is extending the helping hands for all in need for fresh blood only voluntarily. The dream of this organization is to create such a group where thousands of graduate/post graduate level students would be 'all time free' to donate blood for the patients and thus help save thousands of endangered lives around the country. Since the establishment, it is working with own spirit and ideology despite many starting up difficulties. In course of time with support from the fellow members and activists, it is now among the leading humanitarian organisations in Bangladesh. It is the biggest voluntary organization working in our educational institutions. We have to go back 10 years in the timeline from now to know about the inception of Badhan. The nimbus of Badhan was created at a tiny corner of Shahidullah Hall of the University of Dhaka in 1997. On 24th October, 1997 the first committee was formed consisting of 27 members and the first free blood grouping test was done. One may ask why it was started from Shahidullah Hall and why not other halls? As the answer we may draw your attention to the fact that if you visit Dhaka Medical College Hospital (DMCH) you will see that it only takes few minutes to reach Shahidullah Hall and Fazlul Haq Hall from DMCH. The relatives of the admitted patients used to come to these halls from DMCH to request for help as these two halls were located very near the hospital. The students of these two halls used to donate blood on their own at the request of patients and their relatives. The pioneers behind the concept of Badhan felt that there should be an organised way to help the distressed people, to motivate more students for donating blood and so on. From that noble thought Badhan was born. By 2000, all the halls of DU came under its operation, Amar Ekushey and Fazilatunnesa Mujib Hall came under operation in 2001. Then this concept quickly began to spread among other educational institutions. By 2000 BUET, Bangladesh Agricultural University, Carmichael College Rangpur started operation. Then Dhaka College, Bangladesh College of Leather Technology, Tangail Sadat College and Govt. College Rangpur started operation in corresponding areas. Can you imagine every year thousands of patients die in Bangladesh only for shortage of fresh and safe blood? We only need around 400,000 bags of blood every year. Minimum 20 million of our population (Out of 140 Million) is fit both physically and medically and are capable of donating blood thrice a year! If only 0.02% of this population donates blood only once per year, our blood demand would be fulfilled!! If only 0.01% of the capable population donates twice a year it could result the same! (A capable person can donate three times per year!!) We are so unfortunate that we are failing to achieve this easy goal for the lack of proper awareness and social movement because of some illogical fear and superstitions surrounding donating blood. b) To find and match available donors for patients and arrange specific donations for the specific patients. e) To help other organization/institutions working or intending to work in this field. Besides the above major activities, Badhan always responds quickly in any emergency like flood, cold waves etc. Halls and colleges are the functional units. It has unit executive committees and activists who maintain a network in respective halls or colleges and through this network of person-to-person communication they search and match fresh and safe blood donors for patients instantly. Halls of the same public university form a zone to maintain internal relationship and to regulate the units. Each zone has executive committee and members of zonal committees come from units, three from each unit (one zonal representative and president & secretary of hall unit by default). Badhan has central committee headed by central president and secretary. Four members of each zonal committee (two central representatives and president & secretary by default) make the central committee. All of the members of any executive committee have to be current students. The units that are not within any zone are independent units and they are regulated and maintained directly by the central committee. These units have central observers in central committee to coordinate with them. The organization has Advisors, Honorable members who are selected from senior and ex-workers. Each executive committee has advisors and special members are those who were not directly involved but have been giving continuous support. Badhan is working in the important educational institutions of the country. Public universities and post graduate colleges having hostel facilities near hospitals or medical institution are the target areas. First of all it tries to find some students of a particular institution who are energetic and intending to serve the society. Then it forms a group with them. This group starts to motivate others to donate blood and with the help of other fellows of Badhan create a database of all students of the institution/hostel/hall. If it is found that major portion of the students do not know their blood group, then it arranges free blood grouping program with the permission and help of the administration of the institution. Once the database is made, Badhan fellows create a network of personal communication with probable donors, motivate them and match donors for specific patients. Once the system is switched on, some Badhan workers memorize the blood groups of members their last date of donation and next date of donation! This information is also maintained in black and white. They also use computers to make the database more effective. All the year round Badhan fellows continuously motivate possible donors by man-to-man contact, by arranging motivational programs etc. Interestingly, in most of the institutions Badhan fellows are known as Roktochosa (Blood Sucker) or Vampire, Dracula, etc for their constant search for blood!! It is good to know that most of the medical institutions know these volunteers addresses and refer patients to them for blood. Moreover Badhan fellows arrange vaccination program for Hepatitis-A, Hepatitis-B, Typhoid, and Tetanus and also organizes some other health related awareness programs like awareness about Blood transmitted diseases, etc. For safe blood you need safe donor and these programs help to create safe donors. Safe Blood is one that doesn't harm the receiver and the donor as well; is free from infective agents or other harmful agents. In a general sense, blood from a person bearing sound health having no infection/infectious deceases that have ideal percentage of blood components may be considered as safe blood. All blood is tested before transfusion for infective agents. Motivation and awareness are the keys for voluntary blood donation. Badhan emphasizes a lot on motivation. It organizes free grouping test with the intention of creating mass awareness. The workers believe that if anyone comes to them for blood grouping the motivation team might motivate that person for donating blood. So in 2004 they tested blood group of around 24,000 people. In 2005, the number increased to about 35,000. Keep in mind this test has been free of cost. Badhan is the only organization in Bangladesh that does grouping test free. The number of bags donated in 2004 was 10,300 (aprox.) in 2005 it was 17,000 bags (aprox.). These are the number that has been registered in the database of Badhan, but it does not reflect the original number in which the donors were motivated by Badhan. Sometimes the motivated donors donate blood on their own; this type of donation is not included in the database. So the actual number of donation made, motivated by Badhan is way above the countable figure. Unlike the others working in the field of blood donation, Badhan works with its own pace and passion in organizing the donation of fresh blood. It's better to transfuse blood as early as possible after collection. However it takes one to several hours to make some necessary examinations, which are prerequisite for transfusion. It's better to use fresh blood for all kind of operations and other requirements. For performing heart surgery, kidney dialysis, cesarean operation, and fresh blood is a must. For dengue patients, thalassemea patient, patients with hemophilia must use fresh blood. Now a days, in our country fresh blood is more preferable in all cases to stored Blood. According to various medical researches fresh blood is much better in all cases than stored blood. This is why Badhan is working for fresh blood only. If you need blood for your patient do not hesitate to ask for Badhan's help. Its volunteers will try their level best to get your desired blood. But there is an important matter; you have to come with the blood requisition form duly signed by the physician / Hospital personnel. You can come to any unit of the organization. You don't need to know the address of volunteers, just come to the Hall / Colleges near you and ask anyone to find Badhan members or volunteers. Most of the units have notice boards at the main gate mentioning the addresses of the volunteers. Moreover, Badhan's Central and Dhaka University Zonal office at TSC, Ground floor, Dhaka University is open every day from 6.00 pm to 9.00 pm. You can feel free to go to any unit or to central office to get assistance or to know about it. Whenever someone comes to ask for blood, Badhan workers search their database for possible donors, if found then they are asked if he/she can donate right now? Sometimes a donor is not nearby, or he/she is ill. If anyone agrees to donate then he/ she is told to go to the hospital to meet the patient or relatives and the doctor. Almost in every situation the donor does not know the person before for whom he/she would donates blood. They donate blood to the patient irrespective of culture, religion and age. The only motive works is to respond to the call of humanity. This is a large organization and as such financing resources are necessary to conduct its operation. There are various sources. The sources are members' contribution, ex-members / advisors donations, Hall / College / University administrations financial assistance, other persons / organizations donation through advisors, advertisement in the yearly souvenir, vaccination programs. All of the funds are utilized in the regular programs i.e. for free blood grouping motivational programs and for other administrative expenses. Many of its units have no fund. Other units / zones / central committee always extend helping hand for those units to undertake a program. Sometimes even zone and central committee is out of fund. That time units who have little fund help zone / central to perform a program. Badhan is very clear in its source of fund and its expenditure. Although fresh blood donation and motivation for donation is the prime activity, Badhan always responds to the call of suffering humanity, such as flood affected people. 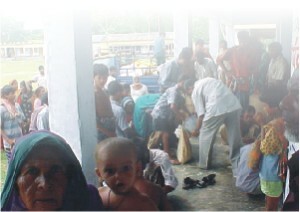 For example, during the floods in 1998 Badhan was a very small organization but in spite of its size and many difficulties it took steps to distribute relief materials among the flood affected people around Dhaka city as well as among the people of remote areas like Laksam and Comilla. Moreover Badhan volunteers worked voluntarily in various food making, saline packaging programs of various organizations. Considering the emergency during the devastating floods in 2004 initially its volunteers worked in various food-making projects of other organizations of DU & BUET campus. As flood situation further worsened, Badhan decided to start a large-scale relief activity on its own. Though it did not have enough financial strength but it had the commitment. Each of its unit, zones and workers were called to participate in the relief work. It had a relief camp set up in its TSC office (during the flood period). People of all classes of the society responded spontaneously. With the collected fund it distributed relief in Rupgonj upazilla, Ullapara, Sirajgonj and Manikgonj. Moreover, volunteers took part in the saline making project of Dhaka University Authority. By this time Badhan had a successful communication with “SpaandanB” (for more, visit www.SpaandanB.org ) and Japan-Bangla Group (for more, visit www.japan-bangla.net). Both of these organizations worked with Badhan in distributing relief among distressed people and rehabilitation program. Successful rehabilitation program has been done in Manikganj and Lalmonirhat. 1) Most of the donors donate blood in various hospitals, Blood centers, etc. Services provide by govt. hospital blood banks are far lower in standard. Collecting blood is hectic, time consuming and some times the donors have to travel far to donate. On the contrary private blood centers are very costly for poor patients. 2) Badhan wants to centralize its donation system for better service. 3) It wants a blood transfusion center, not a conventional Blood Bank. Badhan doesn't want long time preservation of blood rather wants very short time storage system where donors will donate fast. Blood donated by the donors will be examined, sealed as transferable cross-checked with patients and then delivered within a short period. The future plan of Badhan is to spread its activities all over the country. It will work until it reaches and maintain the goal, which is “No one dies for crisis of blood”. This organization is also ready to work in collaboration with the Ministry of Health and Family Welfare, Govt. of Bangladesh, World Health Organization (WHO) and other organizations in the field of voluntary blood donation, motivation and any other humanitarian work. Its army of volunteers is ready to work in any place under any circumstances for the sake of humanity. It also requests the media, both electronic and print, to motivate people in their own way. Badhan believes that the concerned government agencies should undertake measures to discourage selling of blood by professional sellers. This would help bring down the rates of infection among the patients who are often deceived by some corrupt staff of hospitals all over the country. Donation of blood is a gesture of goodwill and care for the fellow human beings. There is no gift more valuable than a Gift of Blood, as it is actually a Gift of Life for the person who receives it. Please be a voluntary donor. You can either donate blood directly for a specific patient through us or at a blood center or at any of the mobile donor session organized by the blood service. If you are yet to donate blood, just think that as many times you denied doing so, as many mothers / fathers / sisters / brothers / and babies died!!! Died only for shortage of one bag of blood, which you could easily donate! Think and take speedy decision for a noble humanitarian cause, decision to save a life, decision to save a family, decision to give some extra moments to a human being, decision to serve the society, decision to serve the suffering humanity! The writer acknowledges to all the members of Badhan, also expresses his gratitude to A. S. M. Moynul Morsad, Taslima Rawshan and Amanat Ahmed for their cooperation.